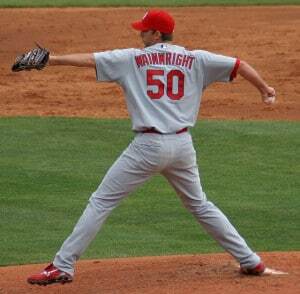 It’s a shame Adam Wainwright will likely miss the 2011 season and need to have Tommy John surgery. This photo is from Spring Training 2008, when I flew into Orlando one March morning and drove straight to the Braves’ spring ballpark. After this game, I motored east to Titusville to watch the space shuttle launch — which it is coincidentally going to do today. Then I continued on to Vero Beach and Port St. Lucie over the next two days. As for Waino, a top-five finish in the Cy Young Award voting this year would have triggered his 2013 option (his second-place finish last year triggered his 2012 option). He’ll be 30 next spring and should have most of next season to pitch for his ’13 contract, though it seems now that there would be little he could do to convince the Cards to pick up the final option at $12 million. Here’s to a full recovery and a return early in 2012.